On a recent trip I took both the Olympus and my old Canon A630 (which was more of a photo enthusiast camera than the current Powershot line, which to me is barely an upgrade from an iPhone camera), and I found that I used the Canon point-and-shoot more than I expected to. Among its advantages are its smaller size, which allows it to be slipped into a pocket and whipped out instantly (the Olympus is a little too big for this, except maybe when equipped with a pancake lens), its shorter time lag time between shots, its silent shutter (the PEN’s is fairly loud), and its swivel view screen, all of which make it well suited for inconspicuous street shooting — it draws virtually no attention. The Canon is also good in low-light situations, when I might not bother to pull out the PEN (unlike the more recent but expensive OM-D E-M5 in the same line, low light is not one of its particular strengths). But how does the image quality compare? Photography sites tend to do comparisons between comparable cameras, which makes sense if you are shopping in a particular segment. It is less common to compare cameras that are significantly different in nature. But I was curious how great the difference would be between such cameras, and I made a quick, unscientific comparison. The results indicate the the larger sensor size and better optics of the Olympus are (as would be expected, or at least hoped) a distinct upgrade from the Canon. (The Canon is 8 megapixels, the Olympus 12.3 megapixels, but I don’t think that is sufficient to account for the difference in these images). The difference becomes more apparent (even when reduced to the tiny size of these blog images) when we zoom in. 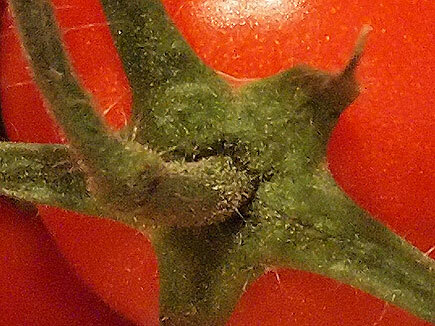 Most obviously, the Canon fails to capture detail in the tomato sprigs, while the Olympus captures individual hairs. There is also a clear difference in the cameras’ ability to capture the quality of the tomatoes’ translucent plastic container (the angles of the shots are slightly different). Bottom line: no surprises (thankfully), but I think it is interesting to see just what the degree of difference is between a relatively top-of-the-line point-and-shoot and a typical mirrorless camera. For people who want high-quality images from a small camera, I would recommend the Olympus PEN series .